THE PEOPLE’S trust in the government is at its highest since 2011, according to the fifth Philippine Trust Index (PTI), a survey by communications agency EON Group. From 40% of respondents saying they trusted the government in 2011, to 58% in 2012, to 50% in 2014 and 2015, trust had grown by 30 percentage points to 80% in 2017. 1,200 Filipinos aged 18 to 65 were surveyed from March to April 2017 — before President Rodrigo R. Duterte declared martial law in Mindanao, and also before the killing of 17-year-old Kian Loyd delos Santos in Caloocan City, with CCTV footage and witnesses revealing that he was supposedly murdered by the police, countering the latter’s initial claims that it was a shootout. Of government “sub-institutions,” the Office of the President had the highest trust at 82%. In comparison, it had 54% in 2011, during the first year of then President Benigno S.C. Aquino III, and the first year EON conducted a survey. In the 2017 PTI, the Office of the President was followed by local government units, with a 78% trust rating. The Senate, House of Representatives, Supreme Court, and Regional Trial Courts had the same trust rating of 67%, followed by the Cabinet, with 65%. The Office of the Vice-President (OVP) had the lowest trust rating among the government sub-institutions monitored by EON, at 57%. As for the main institutions EON monitored in each survey, it found that trust was highest in the Church and the academe at 93% for both institutions. It was followed by the government, the media (78%), business (75%), and nongovernmental organizations (59 %). Government agencies which provided social services were also looked at. Respondents afforded the greatest trust in Philhealth, the Social Security System, the Department of Education, the Technical Education and Skills Development Authority, the Department of Social Welfare and Development, the Department of Health, and Pag-ibig, respectively. On the other end of the spectrum, the lowest trust was given to the National Economic and Development Authority, the Department of Budget and Management, and the Department of Finance, respectively. According to EON chief innovation officer Mori Rodriguez, speaking at the launch of the PTI on Tuesday at the Maybank Performing Arts Theater in Taguig City, this had to do with the frequency of interactions between the respondents and government agencies. People could only trust what they know and understand, he added. 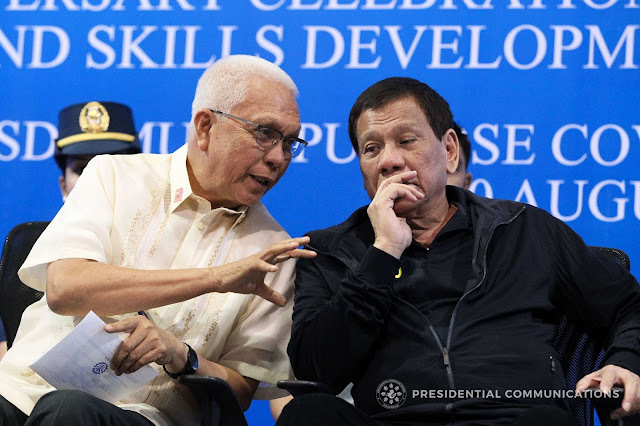 Presidential Communications Assistant Secretary Michel Kristian R. Ablan welcomed the results, saying the Office of the President had tried to draw closer to the public by holding daily press briefings and livestreaming Mr. Duterte’s events. University of the Philippines law student Farah Ali Ghodsinia, who hails from Marawi City, said that Mindanaoans and Muslim Filipinos supported the President because he came from Mindanao and repeatedly talked about his lineage. She believed the government was sincere, and that it was pursuing a “noble goal,” which was peace. After doing outreach work in Lanao, however, she sensed disquiet among the people who were displaced by the fighting between government troops and the Maute terrorist group. “Who really is protecting us here? There are a number of groups who say that the air strikes should stop. But then there are also other groups who say that, you know what, wait, this is being done for your safety and protection. So there is this growing sense of confusion which I feel should be dearly addressed,” she said. She also noted that people were suffering from trauma and needed to hear that the government would not be left behind. Communication between the government and local leaders, tribal leaders, religious leaders, NGOs, and civil society groups on the ground was essential, Ms. Ghodsinia stressed. “You already have the credibility and the charisma, but you know, further boosting on the delivery of [development promises] will be really essential,” she said. Mr. Ablan acknowledged her recommendations. “Of course the bar is set high, and by no means are we going to rest on our laurels. We do recognize that we have to deliver on the… promised programs and everything. Otherwise… the high ratings may fall and they may fall fast,” he said. Iain Twine, vice-chairman for communications marketing firm Edelman’s Asia-Pacific team, added that the government was in a honeymoon period, which was why it was possible that its trust rating would plummet next year. EON also found that Filipinos would trust a government that improved their daily lives in concrete ways. For the first time, EON also looked at social media from June 2016 to June 2017, with the help of its social media listening tool Groundswell. The Office of the President and the Office of the Vice-President were most mentioned among the discussions about the government, at 37% and 29%, respectively. The former had the most positive sentiments, while the latter had the most negative ones. Issues that were most discussed online were the Marawi crisis and martial law in Mindanao, death penalty, extrajudicial killings, war on drugs, and violent groups such as the Abu Sayyaf and the New People’s Army, in that order.